Supporters of austerity have long argued that there is no viable alternative because of persistent government deficits and rising debt. David Cameron put it starkly arguing that ‘there is no magic money tree’. However these assertions contain two important fallacies. First, it is evident that, if government is increasingly indebted it must be the case that the private sector is also an increasing owner of that government debt- government cannot be a net debtor to itself. Therefore rising government debt represents a transfer of incomes, from the public sector to the private sector. Secondly, economies can grow. Otherwise human society would still be in its most primitive phase. Therefore there is no fixed amount of output in the economy, or the monetary denominator of that output. The question posed is therefore, how can a cash-strapped government grow the economy and improve its own fiscal position? The IMF has arrived at an answer. In the latest widely-read World Economic Outlook (WEO), the IMF devotes an entire chapter to the merits of public investment in infrastructure, which it defines as transport, power and other utilities and communications systems. The paper ‘Is it time for an infrastructure push? The macroeconomic effects of public investment’ can be found here (pdf). Investment is one of the essential components of growth. Private sector investment is driven by the anticipated profit, but it has no magic wand to conjure returns from investment which the public sector does not possess It is possible for government to benefit from the returns on investment in the way that the private sector can. In fact there are additional returns on investment to the public sector that are not available to the private sector at all, in the form of increased tax revenues and lower social welfare payment from increased economic activity. In terms of what the IMF calls ‘emerging markets’ this means that the effects of investment are far higher when funded by international loans, rather than transfers from other parts of national budgets (the so-called ‘fiscal policy rule’ usually demanded under IMF country programmes). The research paper also presents a stylised version of its results for the advanced industrialised economies in the current phase of the economic crisis. The results are shown for the change in GDP and the change in government debt as a percentage of GDP arising from a 1% increase in public infrastructure investment, in Fig.1 below (data from Fig.3.9 in WEO). The central estimate is that there would be an immediate increase in GDP and an immediate decrease in government debt arising from infrastructure investment, and that these accumulate over time. By the end of the period 2023 the research estimates that a 1 per cent of GDP increase in public infrastructure investment would raise GDP by 2.8 percent and that government debt would have decreased by 1.75 percent. Although the IMF does not do so, the same logic could be applied to any investment which increases the productive capacity of the economy, most especially education. Public investment produces growth, which produces lower debt and deficits. Similarly, the IMF research does not explore the mechanisms by which this can be achieved. In those economies where there is a greater weight of public sector corporations, where firms and banks are under public control, they can be a direct conduit of increased state investment. The greater the weight of public corporations, the greater the government’s ability to both increase the level of investment and to regulate it. IMF research papers are often regarded as very authoritative, but they are not uncontroversial. Much earlier in the current crisis another WEO research chapter (‘Will it hurt?’) argued that austerity policies would be hugely damaging, depress growth and so prevent any significant improvement in government finances. This judgment has been demonstrated to be essentially correct. Yet austerity has been implemented in most advanced industrialised countries. The effects have been so negative that for many this is the weakest recovery on record, government debt burdens have hardly lifted and now many commentators, the IMF included, are concerned about the prospects for a renewed slowdown. Neither can there be any confidence that the most recent research will lead to a sharp increase in public investment. The key obstacle to that is hinted at in the IMF research paper. There are a number of references to the impact on private sector investment arising from an increase in public investment (‘crowding out’ effects), even though these are generally downplayed. This might seem odd. As the authors note, across all types of economies the bulk of investment in infrastructure is made by the public sector. There is an infrastructure deficit and only the public sector can reasonably be expected to fill it. Furthermore, there is a widespread insistence that reducing the level of public debt and deficits must be the overriding or even sole objective of economic policy. 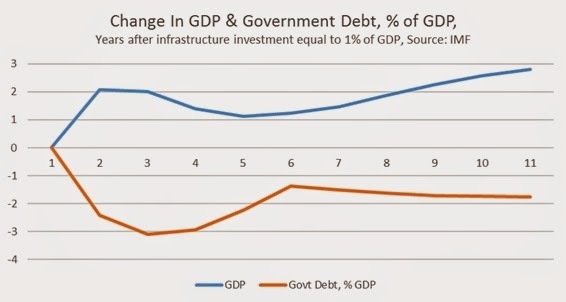 As the IMF research shows public infrastructure not only increases GDP but also lowers government debt. Under these circumstances, the marginal impact on private investment levels ought to be immaterial. However, the entire austerity policy has not delivered growth or improved government finances, exactly as the earlier IMF research warned. The governments continuing to pursue it, as in Britain, are not foolish. Austerity has another purpose. This is to restore the rate of profit for firms. If large scale public investment in infrastructure risks even a minimal reduction in private investment (as the IMF says is possible, but not likely under current circumstances) then it will be fiercely resisted by those firms and those acting on their behalf. This explains why political parties who talk about growth and deficit-reduction are wedded to an austerity policy which delivers neither. It also explains why all the forces arguing for an end to austerity and for state-led investment should expect a long struggle ahead. Is Ireland experiencing a boom?